Quito, located in northern Ecuador, is the country's capital. In recent years, the city has experienced a substantial increase in population in certain parts of the city. Neighbourhoods were formed quickly to accommodate the rise in population without formal city planning. As a result, infrastructure in these parts of the city was lacking. Proper roads were not built and temporary dirt roads were formed as citizens found ways to get around. 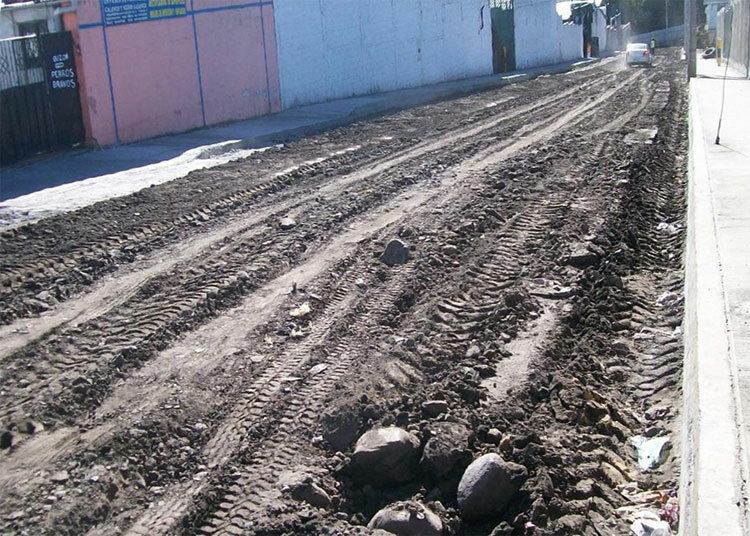 In an effort to improve infrastructure and improve living conditions for its citizens, the Municipality of Quito implemented soil stabilization on two major transport roads in the summer of 2013. Cypher Environmental's soil stabilizer product, EarthZyme® was chosen for these two clay road stabilization projects. The two roads demonstrated increased density post-application and 80 more applications have been scheduled for 2014. 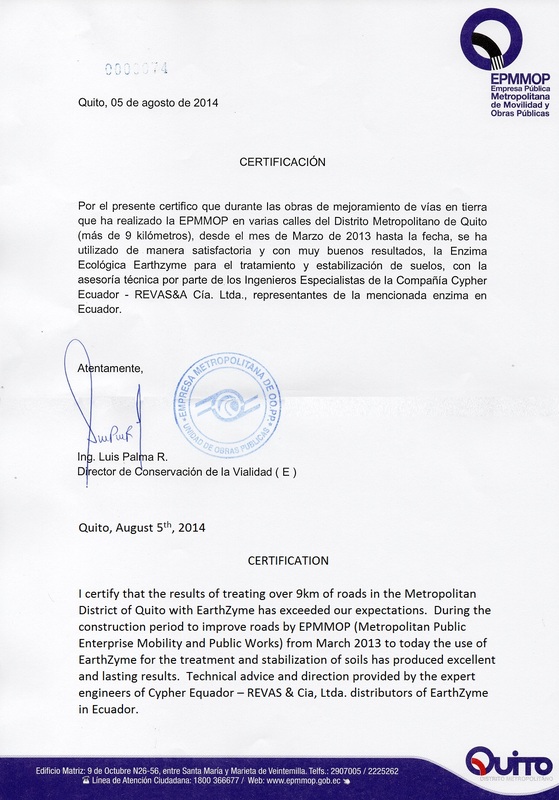 EarthZyme® is used by EPMMOP as a road stabilizer to strengthen the base of roads within the municipality of Quito. This method provides a longer term and more cost effective solution for Quito's city streets. Ecuador has an abundance of clay based soils that are ideal for EarthZyme®. The application of EarthZyme® provides improved density and strength to the base course. This is found underneath a thin layer of pavement called chip seal. 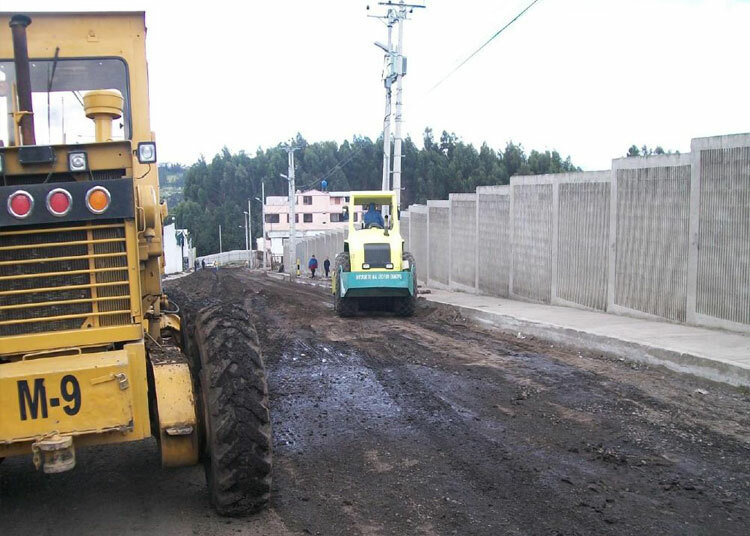 This process allows Quito to produce paved roads using the EarthZyme® and chip seal process at a fraction of the cost of traditional methods. Below is a comparison of the road conditions before and after application, as well as a letter of endorsement from the Municipality. A special thanks to Cypher Ecuador for sharing this story with us! Copyright @ 2018 Cypher Environmental. All rights reserved.